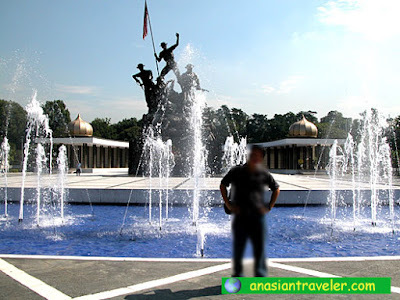 After Dataran Merdeka, our tour guide brought us to the National Monument or Tugu Negara located within the tranquil Lake Gardens; close by to the Parliament House in Kuala Lumpur, occupying an area of approximately 48,562 sq m.
The National Monument was built to recognize and honor those who gave up their lives in the cause for peace and freedom, particularly during the nation's struggle against the threat of Communism (the period of Emergency). 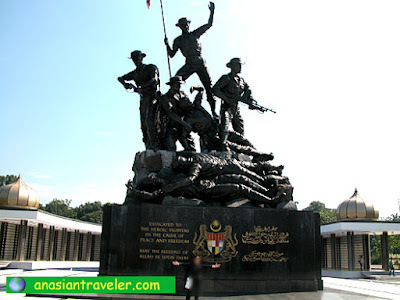 There are five principal components that comprise the memorial site: one is the monument itself that depicts a group of soldiers holding the Malaysian national flag, the Jalur Gemilang, aloft. Each of the bronze figures symbolizes leadership, suffering, unity, vigilance, strength, courage and sacrifice. The topmost figure, at the center, holds aloft the Malaysian flag. He is flanked on the left and right by two other soldiers, both armed; the figure on the left is armed with a machine gun, while the other carries a rifle and a bayonet. Kneeling slightly on the right side of the central figure is a fourth soldier, who is tending to a fifth wounded compatriot. To the front and below these five figures are two fallen enemies. 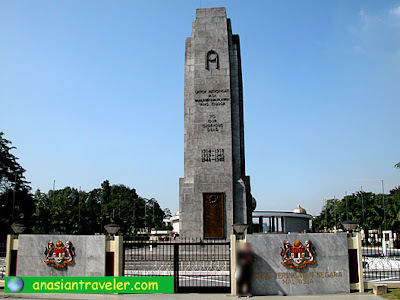 Constructed in 1966, the monument is 15 meters (49.21 feet) tall, made of bronze and was designed by Austrian sculptor Felix de Weldon, who was also responsible for the famed USMC War Memorial in Virginia, United States. 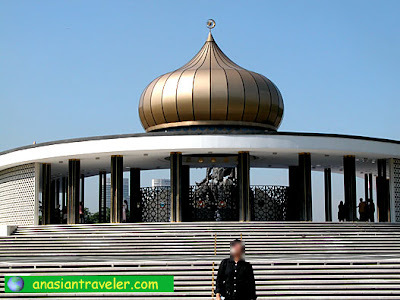 May the blessing of Allah be upon them"
In 1975, the monument suffered extensive damage due to an explosion set off by a communist terrorist. It has since been restored to its original state.